Ten Auckland pupils are likely to have contracted swine flu, tests have found. Health Minister Tony Ryall said last night that there had been 10 positive results from pupils of Rangitoto College who were part of a school party that returned on Saturday from Mexico, where swine influenza has killed more than 80 people. Well at some time we were due for another pandemic weren’t we folks, the joy of evolution means that viruses are always out there trying to come up with a new concoction we have no immunity to, the question of course is if this is the next lethal strain that will hit us as hard as the infamous 1918 influenza and how much reaction it demands. 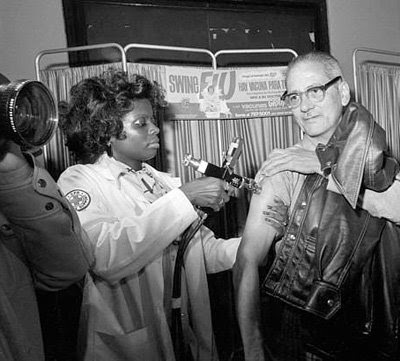 1976: President Gerald Ford orders a nationwide vaccination program to prevent a swine-flu epidemic. "...the joy of evolution means that viruses are always out there trying to come up with a new concoction we have no immunity to,"
YEAH IT'S CALLED GLOBALISATION, OR MORE SPECIFICALLY "EXPORT EDUCATION" OF MOSTLY FOREIGN/CHINESE STUDENTS EVEN IN OUR PRIMARY SCHOOLS, WHAT'S NEXT DADDY DAYCARE?